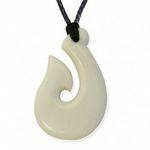 This bone pendant is called a koru it is inspired by the uncurling fern fond commonly found in New Zealand. 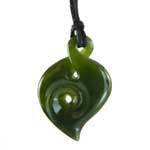 The koru represents peace, tranquility, personal growth, positive change and awakening. 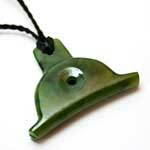 Traditionally used to signify New life, new beginnings and harmony. 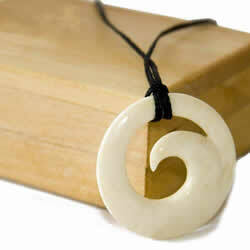 Bone was an important material for the Maori. 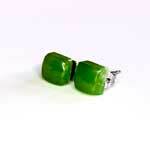 It was hard, durable and simple to work. 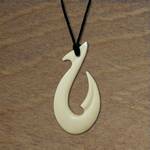 It was used for fish hooks, chisels, spear points and many other useful tools. 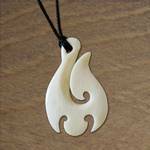 Moa bone, seal ivory and human bone were the main sources. 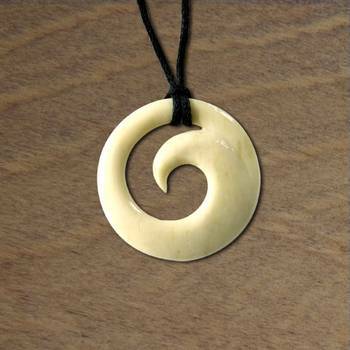 It has been said that once you wear a piece of bone next to your skin, some of you passes into the pendant and the pendant becomes one with you.